Avaaz - Erdogan: End the crackdown now! The Turkish government is discrediting itself by violently cracking down on citizens who are peacefully assembling and expressing their opinions. 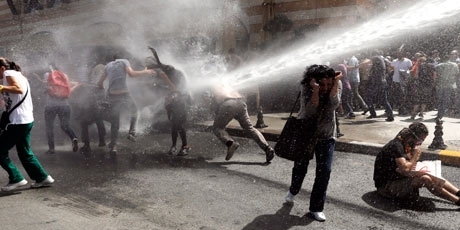 As concerned citizens from around the world, we urge you to immediately cease using violence against protesters in Taksim Square -- including the use of tear gas and pressurized water. We also call on you to stop the destruction of Gezi Park entirely and to preserve the remaining green areas in Istanbul. No mall is worth the injuries that Turkish citizens have sustained since the peaceful sit-in started. I am writing this e-mail from Taksim Square in Istanbul where peaceful protesters are being attacked with gas canisters and pressurized water cannons. Hundreds of us are still here despite the police violence, protesting the destruction of Gezi park which the government wants to turn into a shopping mall. This started simply as a peaceful sit-in to save a park, but it’s become one of the worst state attacks on protesters in recent memory -- and a frightening example of the Turkish government’s growing eagerness to crack down on its own citizens. The security forces have been individually targeting protesters to terrify, wound and kill us. Dozens of people have already suffered trauma injuries from gas canisters -- at least two people are killed, and hundreds are suffering from excessive gas inhalation. Now more than ever, we need massive public pressure to urge the government to stop using excessive force against protesters immediately, to stop demolishing one of the few green spaces left in Istanbul, and to stop cracking down on citizens who are peacefully assembling or expressing their opinions. Sign the urgent petition now then share this widely. Only a giant outcry will pressure Erdogan to act immediately.